A little background for those who don’t know me. 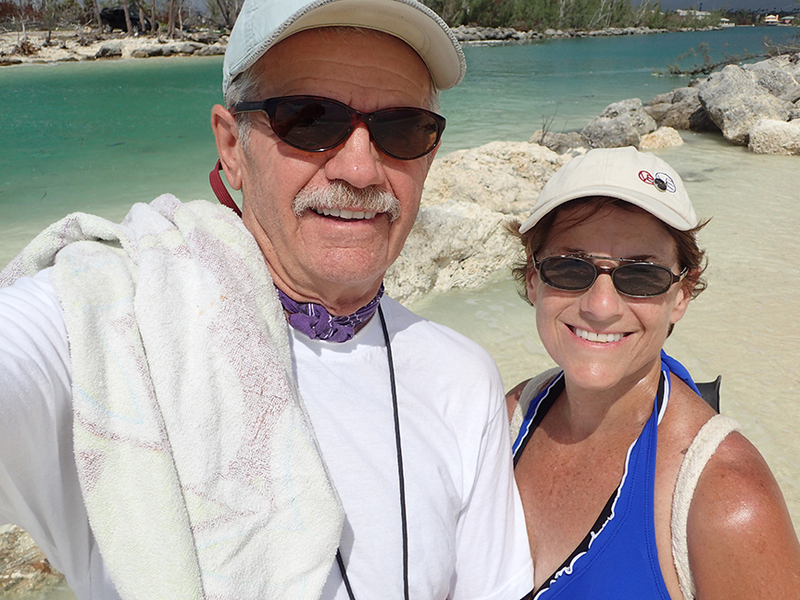 My husband, Dale and I have been traveling to the Caribbean for over 20 years, places like Playa del Carmen, Akumal, and Cozumel, all in the Yucatan Peninsula of México. This year we decided to visit somewhere new. Because we like to travel a couple of times a year, we stick to a strict travel budget that allows us that luxury. I take my clients with me working remotely part of each day. Dale enjoys bone fishing and I enjoy watercolor painting while there. We both enjoy nature and getting to know new cultures, their lifestyles and the challenges they face. The planning and research for traveling to this new place started in January for the September visit. Look for the ‘we are here’ in red. With a little over a week left before our scheduled flight there was a threat of a Cat.5 hurricane called Irma to the Bahamas and to Florida. 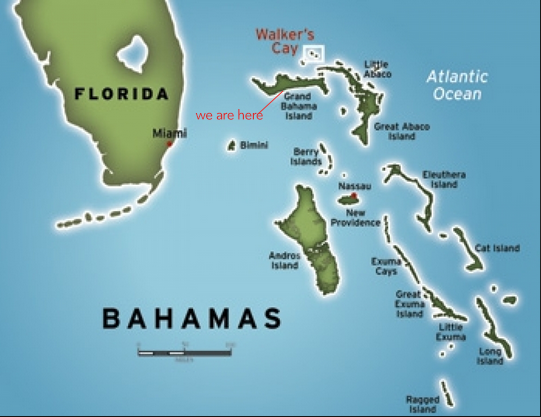 Our destination is the Grand Bahama Island, which is 53 miles off the eastern cost of Palm Beach, Florida. Glued to the weather channel for the next week we watched as Irma curved south/west sparing the island to 50-60 mph winds, some rain and a 3 day power outage. The islanders get a little nervous when it comes to hurricanes and rightly so last year they were right in the path of Mathew, another Cat. 5 hurricane that caused a lot of destruction to homes and the island’s habitat. Just as we were breathing a sigh of relief, here comes another hurricane, José starting off as a Cat. 4. The Bahama Island that it was creating problems for was Nassau, then it headed north/east away from Grand Bahama completely. Whew! Oh, but wait! Here comes a third Cat. 5 hurricane called Maria, following in Irma’s path, two days before we leave. We are beginning to wonder if this trip will happen or not. Another reprieve, looks like Maria is also headed north/east. The owner of the apartment we rented for our trip, said that all is okay, so off we went. 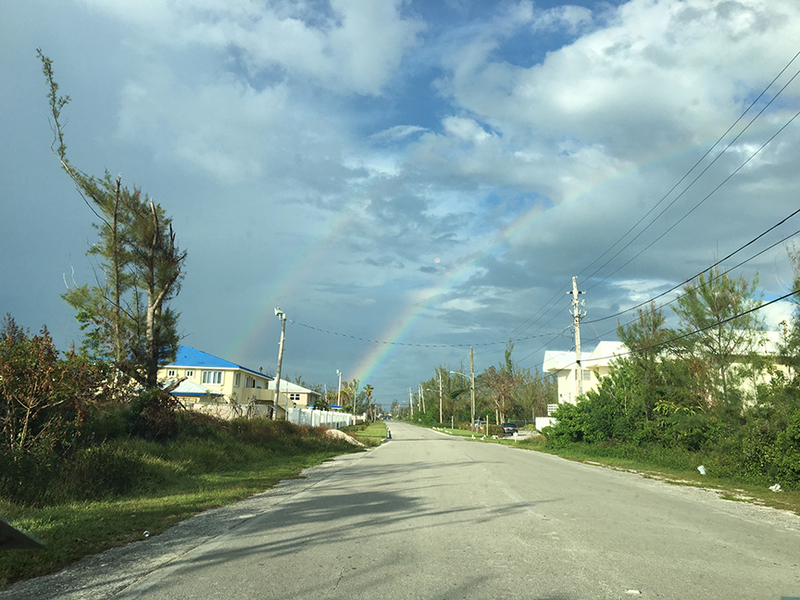 After a smooth day of traveling we arrived at Grand Bahama Island around 6:00 pm EDT last Monday and taxied to the Viceroy House apartments, our home for the next month. Renting for a month allows for a non hurried visit of exploration and the rates are more affordable, too. Pat, the owner, met us there, showed us around the apartment and then said, “I’ll take you to the food store (that’s what they call grocery stores here) if you want.” We knew we should, but after being up early and traveling for 9 hours, we were tired. Accepting her kindness, off we went to the store. Pat’s lovely English accent chattered away pointing out different parts of town as we drove along, on the left side of the road, by the way. She waited for us as we went up and down the isles in a complete daze, however managed to fill the cart with some staples for a few days and breakfast in the morning. Wow, the food is expensive here! Looking out the sliding glass door to the court yard. 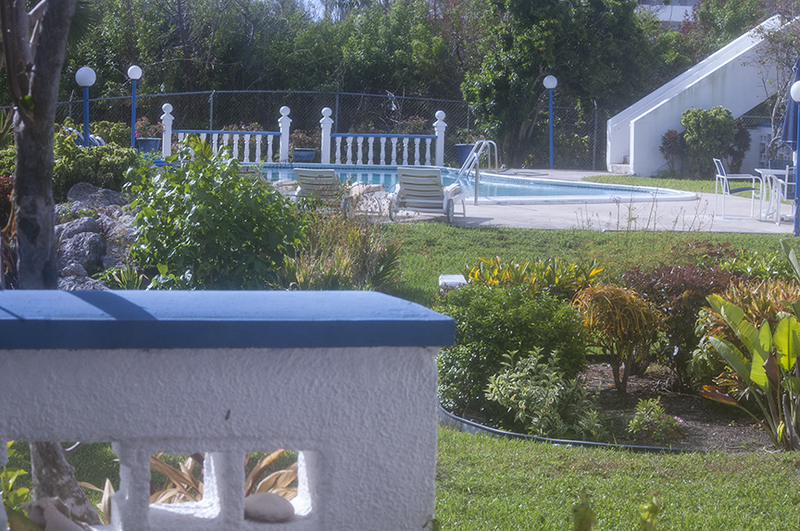 The apartment is very comfortable with most everything we need, plus air conditioning in the living and bedroom. It has a big yard with a large lawn and good size pool. The pool is warm and beautifully lit at night. After a good night sleep (it’s quite here, except for the sound of chirping birds), the apartment phone rings. In our conversation with Pat last night, Dale mentioned that he needed to figure out where to purchase a fishing license. Pat was calling to say that she found where Dale can purchase a license and it just so happens that her husband, Ivan is going there today. Would you like him to pick it up for you? He stopped by to get the paper work, we chatted quite while. 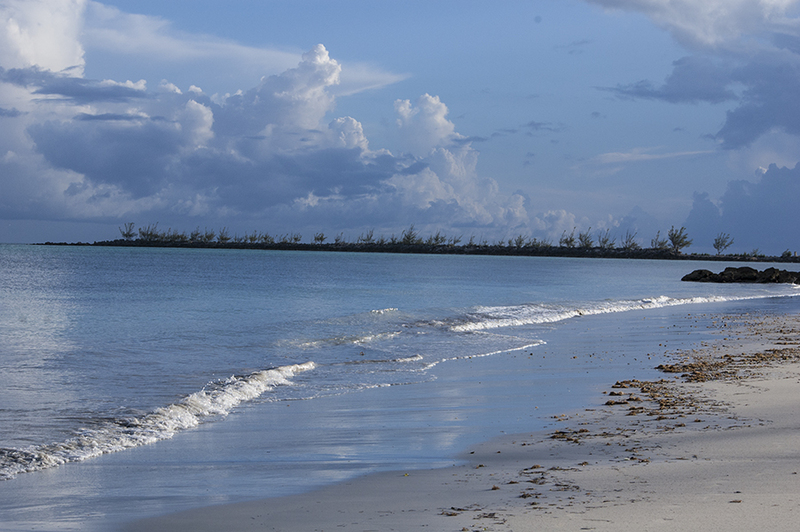 He’s Bahamian and has seen a lot of changes with rules fishing on the island. That was really nice of him! While Ivan was doing that, we thought we would walk 20 minutes to the scooter rental place to get some transportation. Only to find out that there are no scooters available. This was a big disappointment for Dale because he always looks forward to driving a scooter around. On our way back to figure out our transportation options, we thought we would walk a little further to the food store again. We forgot a few things last night. Half way there it started to rain and it looked like there was going to be a down pour, soon. There we were with no rain jackets or umbrella. A woman pulled her car off the road in front of us, and asked us where we were going. When we told her to the food store, she said get in, I’ll take you there. She had saw us walking from the other side of the road and turned around to pick us up. “We’ve got to take care of our tourists,” she said sincerely. Again, really nice of her. We have found that to be the scenario every day we’ve been here. Everyone is friendly, says hello, smiles at you and goes out of there way to help in any way they can to make us feel at home. Oh, so how did we get back from the food store? The taxi from the airport to the apartment was $22 so we knew we wouldn’t be able to use the taxi service very much. But with this many bags of groceries we needed to get a taxi. Then here comes a funky old van with a, ‘local bus service’ sign on it, we asked for a ride. Stan the driver, was super nice, and the fare was $5.00. Before he drove off he wrote down his phone number and said call him anytime. Since the island is 95 miles long and taxi’s are too expensive and the bus service was not reliable we decided that renting a car is the best option. All the car rentals are at the airport so the next morning we called Stan to see if he could take us to the airport. In 10 minutes he picked us up and drove us to the car rental for $10. We got a good price on a long term car rental because it is low tourist season. Oh, did I mention they drive on the left side of the road. Shoulder to shoulder. It’s harder than you think, we are so programed to drive on the right, it seems to take two of us to remember not to! 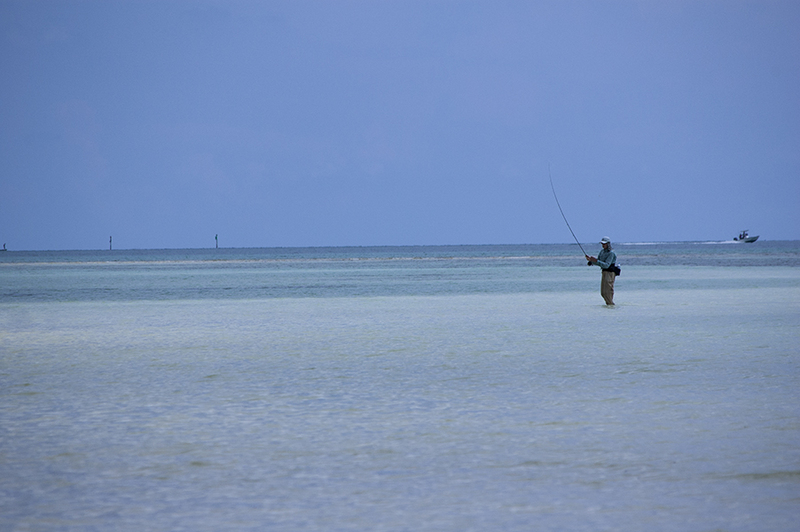 Dale has scouted places to fish, one of those places is Fortune Beach. 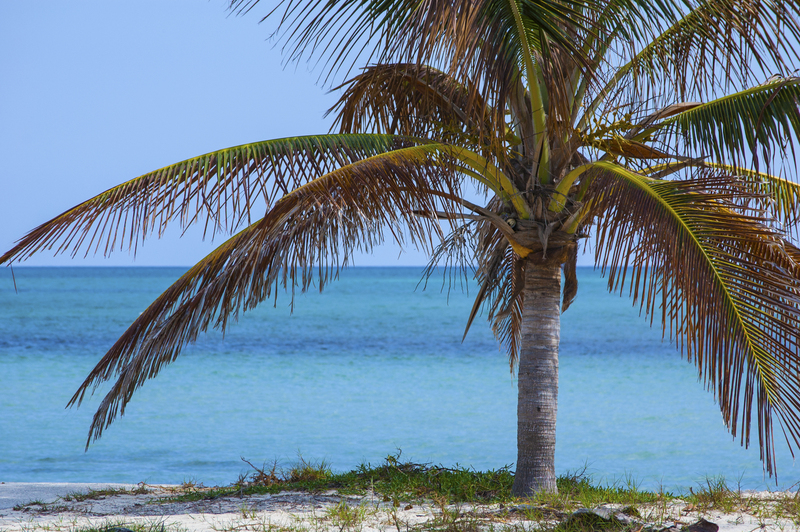 It was about a 15 minutes drive and we parked right on the beach by this palm tree. I’m in awe of the natural state of the beaches here. 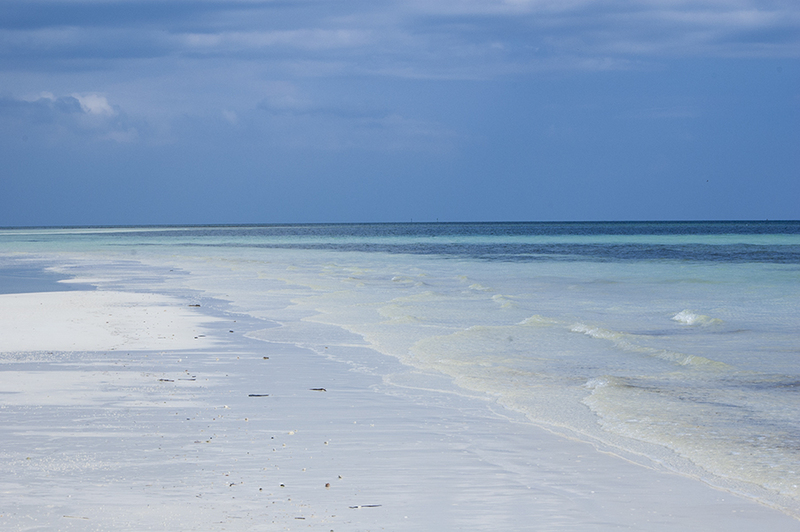 It’s so refreshing to see miles of beach without the interruption of resort after resort. Not mention literally a handful of people on them, except on Sundays when it looked like it was family day. I was equipped with a chair, mat, book, umbrella and towel. I read, swam, relaxed, and took it all in. The sand is soft is feels like powder sugar and the water warm. Dale said he saw some monster bone fish but hasn’t caught any yet. Hooking one of these fast, strong and well camouflaged fish is quit a challenge. Finding the right place with the tide incoming or outgoing at the right time adds to the challenge. He’s still finding the right mix. Oh, and then he needs to have the right fiy. Did I mention that he has about 20 different patterns of different sizes and weights totaling about 400 flies, that he tied for the trip. Low tide, aqua blue water. 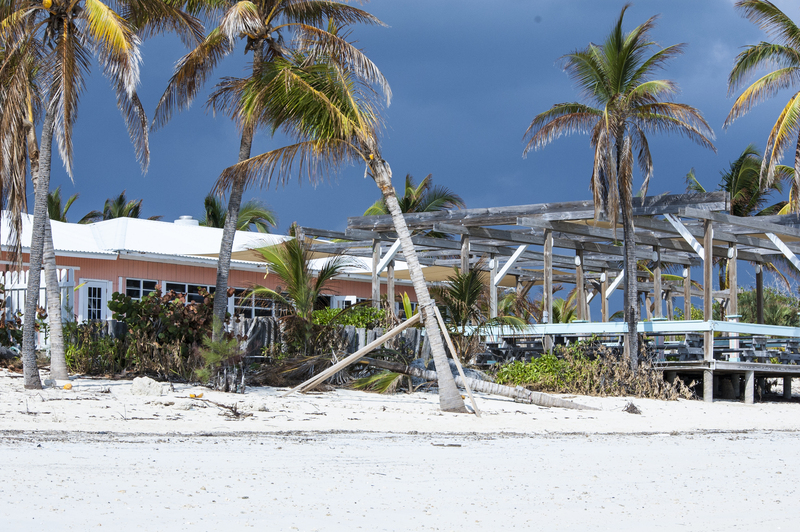 Banana Bay Bar and Restaurant on the beach. When curse ships come in they bus the people to various place like this. Not too many people here this time of year though. 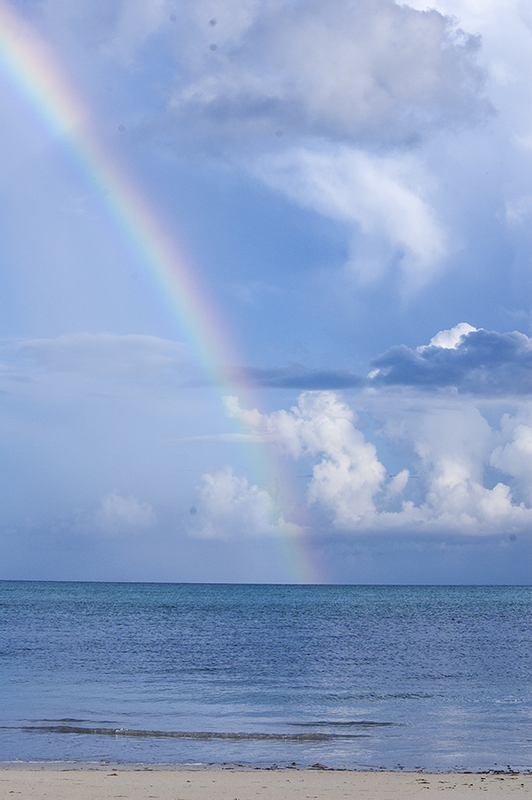 We were scoping out Barbary Beach when this beautiful rainbow showed up. We met a nice couple as we were leaving and visited with them for 20 minutes or so. They were telling us about there visit to Colorado to see the snow. They had never seen snow before, had a fun time skiing but not to much fun driving in it. They shared their experience of hurricane Mathew last year, too. After it was over they went up the stairs to their son’s room, looked up and could see the sky! Yikes! Many people are still waiting for their insurance money to make repairs. We noticed that as we drove around, there are many homes that are repairing their roofs. Waterway from the ocean inland to houses. There is a beautiful beach a five minute walk from the apartment. We went there the other day to see how the snorkeling would be. We walked quite a ways to where the waterway comes in. 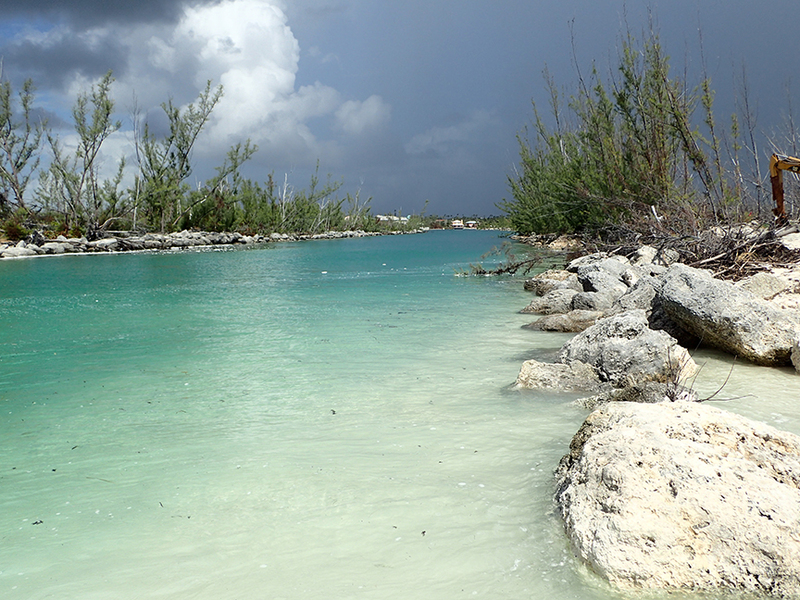 The waterways here are amazing. I’ve never seen anything like it. There are several that go for miles with beautiful homes built along side of them and boats parked in front. The roads and driveways on the other side of the house. We were goofing off taking selfies when we noticed those very dark looking clouds behind us. 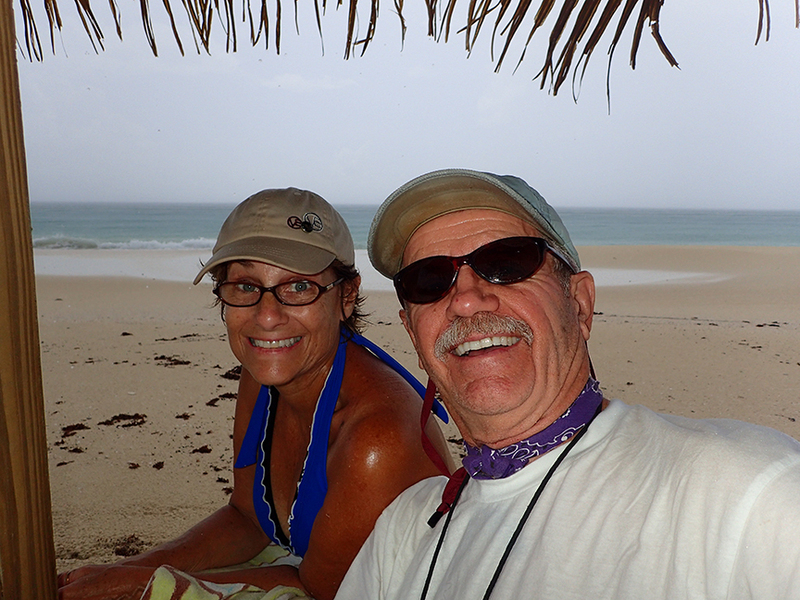 We quickly started to walk back but got caught in the heavy down pour, taking refuge under one of two wooden umbrellas on the beach in front of a hotel. The storm lasted about an hour but we didn’t. After about 20 or 30 minutes we made a run for it, just getting completely soaked and laughing at ourselves the entire way. We have much more to explore, see and do. Onward to week two, stay tuned.